When I first saw this little buggy, I immediately thought to myself, "Oh look, a generic version of the epically horrible Fast Lane AJ-058." Then I noticed that unlike the AJ-058, this one comes with all batteries included, and it uses a rechargable battery pack for the car. I tried out a demo model on the spot, and what do you know, it was pretty fast! I ended up taking home one of these and one of the truck version. The only peculiar thing is that there's no indication on the box of who the manufacturer is -- it's just completely generic. It also comes with no instructions whatsoever. Thanfully it's easy to figure everything out, and it's not possible to plug the battery into the car incorrectly. The one thing I really wish they told us was how long to charge the battery on the included wall charger. Based on the charger's rating (on its little label) and the rating of the battery, you'll want to charge the battery for 3 to 4 hours each time. As you'll see in the video, I tested this buggy out both on a flat, paved surface like most kids will use it on, and a dirt/gravel surface that I'd hope an off-road vehicle would be able to handle. I'm happy to report that it handled both just fine. 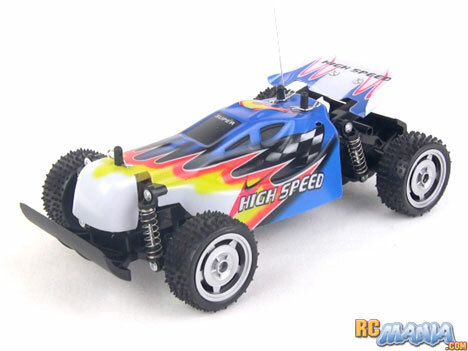 It's indeed quite quick and its top speed is probably the best I've seen in any toy-grade off-road buggy in this size range. Steering is responsive, too, making the buggy feel very lively and exciting. On a bumpy off-road surface it's not as fast as on flat ground, but it does traverse rough gravel pretty well without getting stuck, and you can take it over small makeshift jumps. It has enough power to drive up a mild incline as well. In all, especially when you consider the price and the fact that all batteries included, this anonymous little wonder is a bit of a diamond in the rough.